I've been reading a lot about nail designs done with dotting tools. I really like the actual layered-dotted look, rather than the polka dots. I wanted to try painting layered dots onto my nails, but it wound up looking more like regular dots. I did layer some dots, but not in the way I really planned to. Next time, I'll have to try a more specific design- perhaps one that borders one corner of each nail! 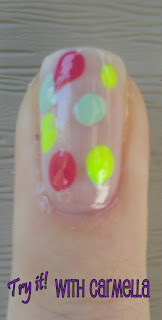 I think if all the dots were in one area of the nail, it would look cool! If you are like me, you may be wondering, what is a dotting tool? I certainly didn't know! I don't even own an actual dotting tool. I imagine you can really use anything with a rounded tip... a paint brush, toothpick, end of a toothbrush, etc. I used bobby pins! I simply bent one side of each bobby pin (to avoid making 2 dots at once). Once I bent the bobby pin, I stuck the bent end into my nail polish bottle. Once the pin was covered with nail polish, I just touched the tip onto my nail. I found that being a bit more liberal with the amount of nail polish resulted in a better dot. I let each color dry before I applied a new color of dots. As you can see, I wasn't too patient in letting them dry and a few of the dots got smudged.